One of the dangers we preacher folks tend to fall into when evaluating the ministries of our congregations is to focus on the metrics of participation, membership, and financial giving. There are good reasons for this, from denominational expectations around those numbers to the fact that these numbers have the most impact on our day to day work. Church “growth” is often evaluated by these metrics, which are pretty easy to gather and seem like a reasonable sign of congregational vitality. The focus on these numbers goes back to the earliest days of the church, when Luke breathlessly reported that “…thousands were being added to their numbers each day…” and Ananias found himself on the losing end of a decision to lessen his tithe. This swam back into my thoughts today as I began thinking about our ministry here in Antioch. There is no doubt that by many of the metrics of participation we have been struggling. Membership is flat. Worship attendance has been declining. Financial giving has been relatively stable, which has been a great sign of hope that those who are here continue to be continued to the viability of our ministry in this community. But all in all, based on the traditional metrics of participation, it is easy to fall into despair that we are in decline and not succeeding in our ministry. And yet, in a conversation with our Church Council chair this morning, I began to think about the activity of our church beyond those metrics of worship attendance and membership, and began to realize that while those aspects of our ministry may be declining, there are other ways that we continue to have an impact in the community for bringing forth God’s kingdom reality. One of the gifts God has given us is a pretty useful facility. I drive by congregations all the time who have growing Sunday morning attendance but whose facilities are relatively unused. That isn’t the case for our church, for we have embraced sharing the facility as a gift with the community. Our church has some group of one kind or another in the building almost every night — groups that we aren’t especially aware of. They may be basketball teams practicing or a neighborhood association gathering to talk about issues in the community, but when put together we discover that our congregation is in “ministry” with these folks simply through sharing the gift of our building with them. These “ministries” usually don’t translate into Sunday morning worship attendance or an increase in membership, and yet they are a means by which God’s hospitality is offered to our neighbors. When I begin to look at our footprint as a congregation, I find myself with much more hope, for our reputation as a servant to the community goes way beyond how many folks are present on Sunday morning. The footprint recognizes that the metrics of participation are but one piece of evaluating congregational vitality and impact, and that many more of our congregations are much more successful than we might think. What is ore important, a thousand member church that has little impact on the world or a 100 member church that is bringing forth transformation? Understand, this is not an attack on large congregations, for the footprint of these congregations is often huge and they are engaged in ministries of transformation. The problem lies in the tendency of all of us to believe that bigger is better, and to fail to recognize the footprints of smaller congregations that are often much bigger than one might think based on their size. 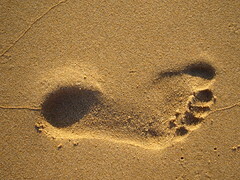 How would you measure your congregation’s footprint in the world? What are the signs of congregational impact on your community that go beyond your Sunday morning attendance? Am I simply in denial, or do some congregations have “big feet” that go far beyond their Sunday morning attendance? I believe that there are small congregations with “big feet” making an impact in their community. I’m serving one now. Our attendance has been flat, our giving has been steady and our membership has declined slightly primarily due to death. Yet, this congregation with an average attendance of 40 provided 630 boxes of food for 485 families during November – over 14 tons of food. Now, tell me that we aren’t having an impact on our rural community. I am happy to see that Table I of the dreaded year end reports now includes a line to report the number of people touched by your outreach to the community. At least in our case, this will be a number to celebrate. Our basic measure for the last couple of years is Ken Callahan’s emphasis on “number of people served in mission.” Our desire and goal is to look for ways to serve more people in mission–both inside and outside the church. It is a useful tool for planning. And that’s what we’re about, isn’t it? Mission.